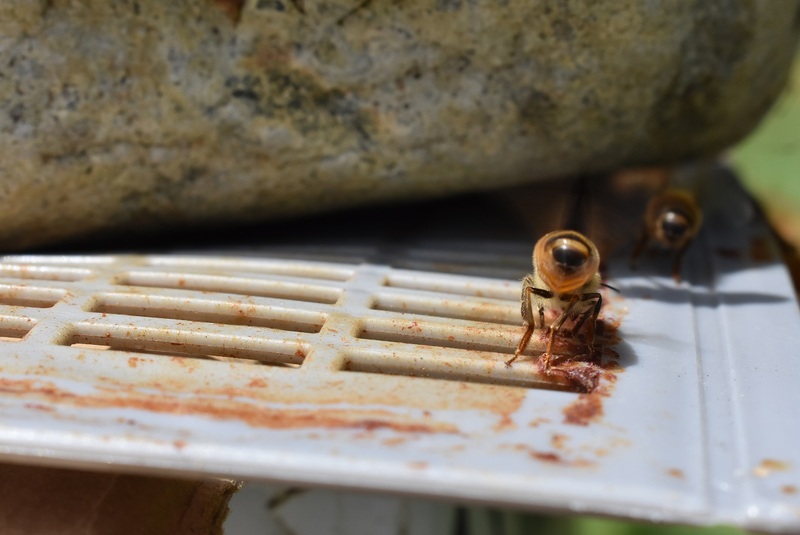 Home Around the Farm Beekeeping If I’m Allergic Can I Still Be A Beekeeper? About 1 in 20 people are allergic to honey bee venom. Among those who are allergic, there are definitely varying degrees of allergy. Stings are a hazard of being a beekeeper. There’s pretty much no way to prevent them. Believe me, when I first started I was very worried about this fact. I bought the full ‘moon-suit’ for head to toe coverage (see above). Then I got stung three times in the face through the mesh. That pretty much clued me in that I was gonna get stung no matter what. I came to terms with that. I had almost no reaction to being stung that first time, so I wasn’t really worried about it. Since then, my reactions have been steadily increasing and getting worse. Not taken on that day, but maybe the sting was payback for the booty photo? On Friday, I was out in the yard taking photos of the garden and my hives (I can’t really go near my hives with a camera without taking pictures, It’s a weakness). As I told the nurse in the ER an hour later, I think I caught one of my girls having a fat day. She did NOT like me taking photos. She buzzed into my hair, and I froze, letting her figure her way back out to freedom. When she did, I started walking smoothly away, and she bounced my camera a few times. I was well over 10 feet away from the hive when she came in for one last pass and stung me in the right eyebrow. Monday morning, one of my first tasks of the day was to call the allergy clinic. However, I was informed their next appointment was in September. Over 2 months away. To say I was horrified at the idea of staying away from the bees until September would be a bit of an understatement. But the real question was not whether I could or should stay away until September, but whether I can, or cannot, continue to keep bees when allergic to their venom. It’s a part of a bigger dream I have. Possible to get other family involved. Anyone else see the glaring issue here? Because my pros list is awesome! I really do love the bees. I have let the dream die down once or twice because of my disappointment with how poorly I did during my first season, but the more I get stuck into them, the more I WANT to get stuck into them. But the big issue is the idea of a potentially fatal con if they get ‘stuck’ into me. Are There Other Allergic Beekeepers? Because of the 1 in 20 chance of having some form of allergic reaction, I figured it made sense to search around and see if anyone else has the same problem. It turns out, there are plenty of beekeepers in the same situation. Not too surprisingly, they have all taken different paths. Some have continued to keep bees. Others have loaned their bees to others while they go through immunotherapy. Still others have given up on beekeeping altogether. This is, for me, an incredibly tough decision. It seems like it should be a no-brainer to quit something that might have a health risk attached. But honestly, there’s a health risk attached to getting in your car and driving onto the road. There’s a health risk to eating out at a restaurant. Is this a more certain danger than that? Should I quit? Should I continue to keep bees, even if I’m allergic?